The Locust Blossom: What's So Special About This Pot Roast? What's So Special About This Pot Roast? It's just a pot roast - right? 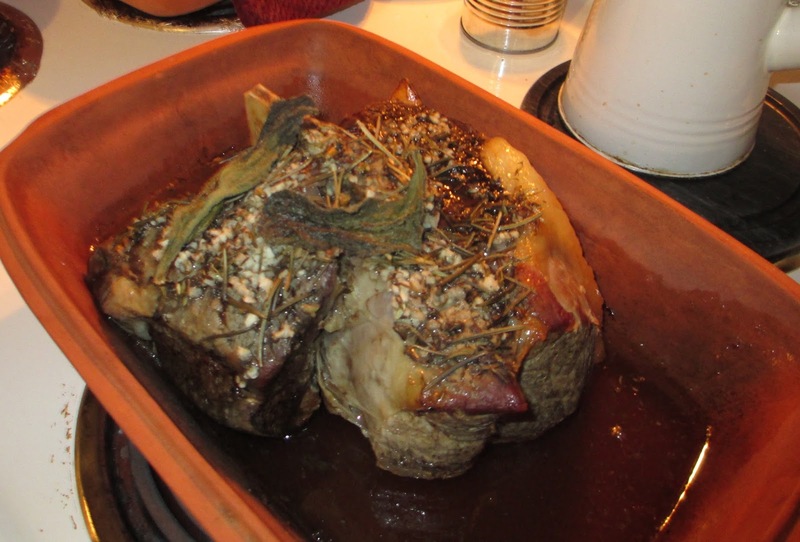 This is a bone-in chuck roast which in the store would be a lesser quality cut. We happen to savor it. In order to serve a dual purpose, I will share how I prepared it. Here I added garlic, rosemary, thyme, and borage. I added no water, sauce, or broth, just the roast. It went directly from the freezer to the terra-cotta roaster so was still frozen. These terra-cotta roasters are expensive if you go to a kitchen shop. I often see them new and still in the box at thrift shops for a few dollars. My guess is that people don't know how to use them. But again - that's my guess. They will season with use. Cover and place in oven at about 235 degrees. This is when I leave for work. let's get back to what makes it so special. We saved for this roast for a whole year. Why did it take a year to save for a roast you ask. Well, because it was attached to the rest of the beef we purchased. Again not just any beef. This steer was purchased as a weiner calf - so about a year-ish old. It was then turned out on a grassy pasture all spring and summer. for about the last month or so of its life. so that the young tender sprouts could get sun and grow healthily. He pressed new seeds into the earth allowing them to be germinated. And he fertilized the pasture with his "left-overs"
which in turn aids soils in water retention, carbon sequestration and fertility. stayed right here in our community helping a friend/neighbor. And now he is helping to nourish our bodies. He is generous indeed ~ and we are thankful. I don't trim any fat off. I try to get the health benefits of saturated fats when I can. And do you see all that broth - it's about 1 1/2 inches deep. I heated up some home canned corn & we ate. and future fodder for next year's calf. Not too bad for a critter that says, "Moo." That's what makes this pot roast so special. Your roast looks so darn good!!! I see terra cotta roaster and always wanted to try one, now I will. The aroma must have been heavenly. Borage plants habe the most beautiful blue flowers, which really attract the bees. I have never cooked with it though. I love coming home to house filled with the smell of supper cooking. I am going to have to give your pot a try. We just sent a steer to the butcher and am looking forward to fresh pasture raised beef. That's fantastic! I found a round terra cotta cooker at the thrift store and grabbed it, but it has no lid. I'm guessing a terra cotta lid would be better than any old lid I could find to fit (it'll need a big one). I confess I've not known how to use it either, so this post was very helpful. I am now in love with your terracotta cooker, I had never seen this before I have used the terracotta pots for muffin but that's about it. Thanks for Sharing on Strangers & Pilgrims. Such a nicely written story about the value of neighbors, animals we raise and tools we use! I have some terra cotta also but haven't used it very much, and now I am inspired to get it out and cook a beef roast! Thank you! The Loom is in the House!